Just got back ... from a very nice wildlife-viewing drive up Blacksmith Fork Canyon. We saw lots of deer on the north side of the steep hill just south of the Hardware Ranch visitor center, 35 to 40 of them in quite a small area. Most exciting to me: we saw our first Northern Harrier of the year, in their classic low-and-slow hunting pattern over the big meadow about a half mile west of Hardware Ranch visitor center. A bit further west we got a great view of two Sandhill Cranes, browsing along the edge of a meadow about 100' away from us. All three of those viewings were high quality: as much time as we wanted, relatively close, and unobstructed sight lines. We watched the harrier for about 15 minutes – it's not easy for me to tire of watching that effortless stunt flying. That's not my photo at right, but I wanted to show the light coloration. 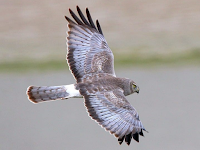 Later in the year the Northern Harriers are distinctly darker; this one surprised us with how pale it was. A confession... If you had asked me a month ago what the chances were that I'd pay $100 to subscribe to the Washington Post for a year, I'd have confidently asserted that the chances were exactly zero. I'd also have asserted that there was nothing conceivable that would change my mind. I'd read enough of their articles to know that their commentary was overwhelmingly in the “uninformed liberal” category, and that liberal bias spilled over, well, liberally, into their allegedly straight news stories. If I wanted liberal bias like that (and actually, I do for the purposes of informing myself), I can get all I want for free from National Public Radio (including their online material). But now I've gone and done it. A couple of weeks ago I plunked down my $100, and I was definitely not happy about it. So why'd I do it? Because the Post found a way to entice me: they hired one of my two favorite columnists in the world, and now her work is behind the Post's paywall. The Post got Megan McArdle. Damn them! Also, good for them. It's an interesting choice they made to hire a writer who can be depended on to bash liberals whenever they deserve it (and conservatives, too). And, I sincerely hope, it's also a good move for Megan. I don't think it matters much, from her perspective, what bias the platform hosting her has – her work transcends and ignores that, which is precisely what I cherish about it. I hope she got a nice jump in compensation for this move (away from Bloomberg). In these politically polarized days, the tendency is for everyone to be categorized as “liberal” or “conservative”, with some relatively crazy minority identifying as “libertarian” or some other group. 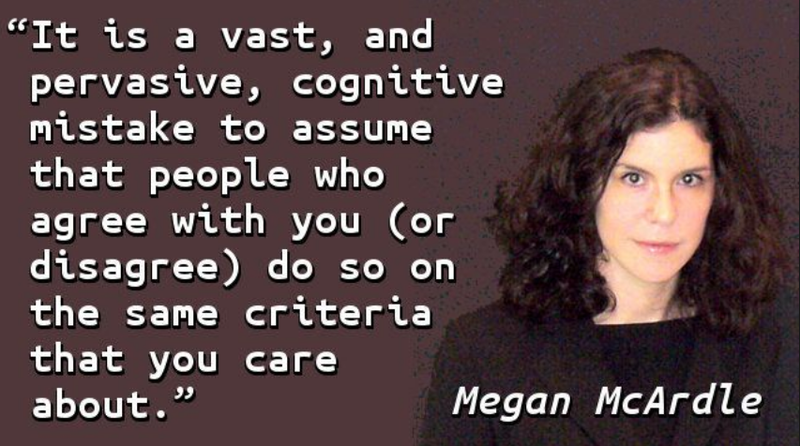 I don't fit into any of these categories, and so far as I can discern neither does Megan (though it's often said of her that she “leans right” . I think she has her own category to herself, which I'll call “sober and rational”. This country could use a few more Megans. Actually, a lot more Megans. But, dammit, I hate forking over my money to such a biased platform!